Legislation to boost energy and water spending and a separate plan to cut billions of dollars from an Energy Department loan technology program both could make it to the Senate floor next week. The chamber is expected to take up the fiscal 2019 spending bill that would increase funding for both DOE and the Army Corps of Engineers. It also is due to vote on a package of $14.7 billion in cuts from unspent funding from past years that the White House has made a priority. The $43.7 billion energy and water appropriations bill would move as part of a three-bill package, known as a minibus, that will also contain funding for military construction-veterans affairs and the legislative branch. The House passed its version of the minibus last week. 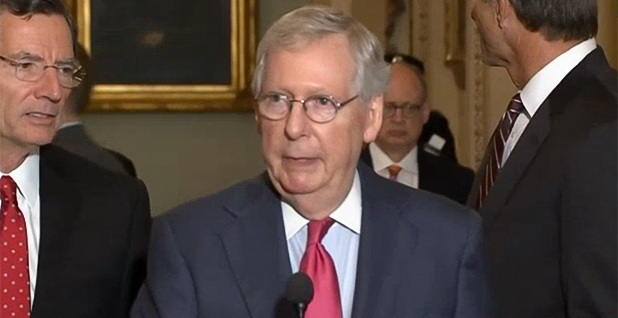 "We're going to move to the minibus that the House has sent over after we finish the defense bill," Senate Majority Leader Mitch McConnell (R-Ky.) told reporters yesterday. The Senate is pressing to complete work on the annual defense authorization bill by the end of this week. "There's a good chance that it will be" on the floor next week, Sen. Lamar Alexander (R-Tenn.), chairman of the Senate Energy and Water Appropriations Subcommittee, said when asked yesterday about his panel's bill. He said the Senate would amend the House-backed legislation with a version approved by Senate appropriators in recent weeks. Senate Appropriations Chairman Richard Shelby (R-Ala.) noted the minibus would be the first spending bills to hit the floor this year and framed it as a test of whether the Senate could move appropriations measures without running into partisan fights over policy riders. "I hope we can be disciplined enough to not put riders on appropriations bills that should be on authorization bills," Shelby said yesterday. The Senate's top Democratic appropriator, Patrick Leahy of Vermont, has said he is working with Shelby to eliminate "poison pill" riders. The House passed a $44.7 billion bill last week after votes rejecting Democratic bids to cut funding for building a Yucca Mountain nuclear waste facility, scrap a water rider and increase spending for the Advanced Research Projects Agency-Energy. The Senate bill could avoid those fights entirely. It does not fund the Yucca facility, does not address the Obama-era Clean Water Rule, and favors increased research and development spending for DOE. Sen. Lisa Murkowski (R-Alaska), who leads the Interior-Environment Appropriations Subcommittee, yesterday called the minibus a "trial run" for a later package that could include the Interior-Environment bill, which she noted has never made it to the floor in the time that she's been the top Republican on the subcommittee. "You're going to see minibuses," Murkowski said. "You're going to start seeing them soon. We are not going to be in the first minibus, but hopefully we'll be in the second. I think we're going to have an indicator here in the next week or two as to how these approps bills are going to move forward. And my hope is yeah, we're going to be on the floor." The Senate is also expected to have a vote on the rescission package that narrowly passed the House last week. Under federal budgeting rules, the White House can offer rescissions and Congress has 30 days — in this case until June 22 — to approve them, otherwise the request dies. It cannot be filibustered. Office of Management and Budget Director Mick Mulvaney met with senators yesterday to press the case for the spending reduction, saying the money would otherwise be unspent. More than $4 billion in cuts would come from DOE technology loan programs, an effort created by an Obama-era economic recovery package. Cornyn said he would back the package, noting it would not affect the budget agreement reached this spring to increase fiscal 2018 and 2019 spending. He said it was "undetermined" whether it could pass the Senate by a simple majority or whether it might be amended. Shelby said he was still reviewing the rescissions but expressed some skepticism, saying the package may be "more optics than substance." Murkowski said yesterday she too remained undecided but reiterated her view that it is the job of appropriators to decide whether to rescind funds already appropriated.